about this book: Picture Sherlock Holmes, dressed in his finery, looking through a magnifying glass. Now picture a frumpy, ordinary housewife behind that magnifying glass. That would be me. I'm the frumpy housewife, but that really doesn't matter. What does matter is that I've spent the past few years stalking God. I asked intrusive questions and chased Him to no end. Sometimes He let me pin Him down. The 'stalking' involved spending hours of quality, quiet time in His presence every day. The pay off? It's all right here in my book - "THE INSIDE SCOOP ON GOD." What's in it for you? Well, you want to know God, don't you? He's more famous than any movie star, and quite frankly he's a heck of a lot more interesting. After reading my book you'll not only learn about God, but your curiosity will be piqued to the point where you'll want to be able to hear His voice for yourself. Who is God? What does He think about us? Curious minds want to know. 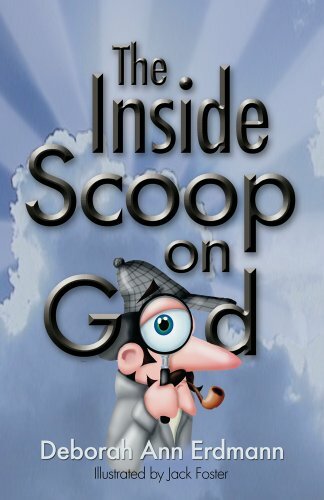 Get the dirt on God and have a few laughs along the way -Get "THE INSIDE SCOOP ON GOD!" • "I laughed and pondered my way through this book, and so will you!" — Reverend Sandi Querin, Pastor of The Revival Center in Clovis, CA, author of "The Prayer of Job" and "The Prayer of Moses." • "A daily dose of these humorous stories will be just what the doctor ordered. Don't miss it!" — Karen Hossink, author of "Confessions of an Irritable Mother" and "Finding Joy."